Though the iSCSI protocol is old enough (IBM announced this technology in 1998), only nowadays it has gained popularity in the network data storage. iSCSI is an abbreviation from Internet Small Computer System Interface. This is a protocol for the interaction and management of storage systems, servers and clients. The iSCSI protocol is used to transfer data via networks and allows to see a disk as physically mounted one, while in fact data storage can be in some other place. More and more NAS devices are used for storing iSCSI LUNs. This protocol is available in Synology, QNAP and other NAS devices. 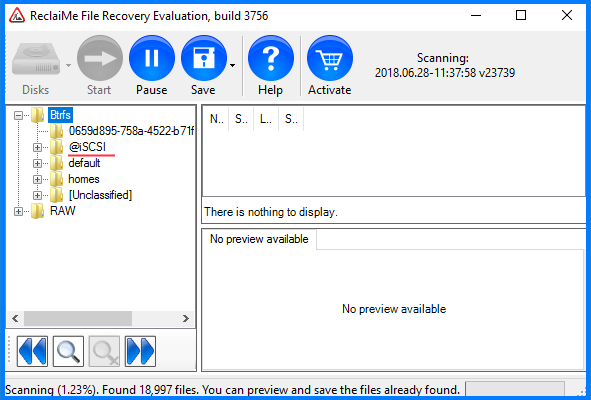 If you accidentally deleted an iSCSI LUN, or you deleted data on the iSCSI LUN by mistake, or you just can't access the data stored on your NAS device, you can try DIY data recovery, but be aware that the recovery process differs significantly from the recovery not involving iSCSI. Besides, there are very few software solutions for iSCSI data recovery. 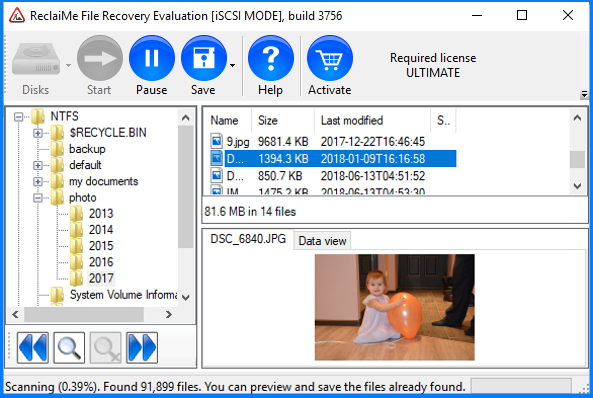 ReclaiMe File Recovery is one of the few tools that can recover data in automatic mode from the NAS devices storing iSCSI LUNs. Prepare a storage device where you will copy the recovered data to. Extract the drives from the NAS device and connect them to a Windows PC. Connection the drives directly to a PC motherboard is preferable, since USB connection isn't stable. It may happen that a disk drops offline during scanning and you will have to restart the process. 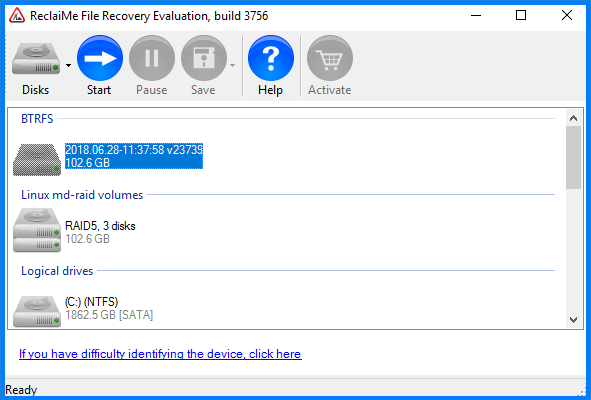 Download, install, and launch ReclaiMe File Recovery. Select the device for scanning – look for it under the BTRFS section, or Linux md-raid, or Linux LVM section – and click Start. Wait till the software brings the data. Pay your attention to the EXT or btrfs folder. Open the EXT or btrfs folder and look for the iSCSI folder in the folder tree. Click on any file for preview and get the warning message about iSCSI LUNs where you can select a LUN which you need to recover data from. If you need to recover data from all the LUNs, you have to do the recovery for each LUN separately. In the new software window select the partition and click Start. Wait till the software starts bringing iSCSI LUN data. ReclaiMe is designed to bring data earlier into the scan and therefore you do not need to wait till the end of scanning. Typically, after 5-10% of scanning all data is already recovered. Estimate the recovery quality using the Preview function — click on an image file (.jpg, .tiff) and check whether it is displayed correctly. If it is OK, most likely all other files are also good, and you can start copying the files. 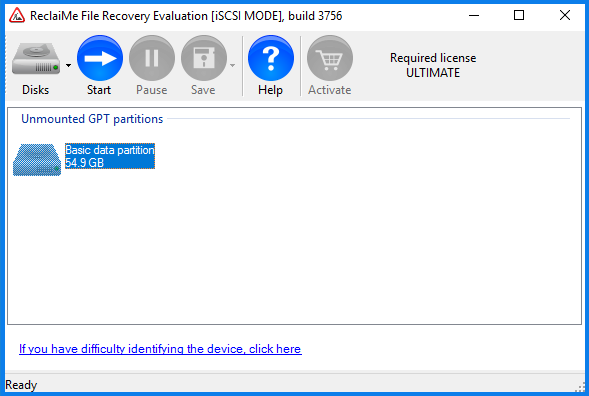 Purchase an Ultimate license key, activate the software, and copy the recovered data to a prepared in advance storage.